The latest superdraw jackpot is coming, with a £100 Million-plus jackpot up for grabs on February 1st, 2019, and you can still bet on it at lottoland.co.uk for only £2 a line bet. With the next Superdraw set to take place on the 1st of February 2019, place your bet with Lottoland for just £2 for your chance to win the top prize of over £100 million. Discover why you should place your bets at lottoland.co.uk when the next Superdraw rolls around. Are You Our Next Big Millionaire? Why Millionaire? Because that’s the big dream and at Lottoland, we all like to DREAM BIGGER! Millionaire is our exclusive lotto betting game that gives you all the things that you love about Europe’s biggest lottery for only £2. Even though you bet on Millionaire to win prizes equivalent to those on Europe's biggest lottery, the numbers are selected from the Swiss LOTO EXPRESS keno game. This is an official game of the Swiss National Lottery that is accredited by the World Lottery Association. Swiss Loto Express results can be found here. We take the first five numbers drawn between 1 and 50 from the 9.40pm GMT draw, then the first two extra numbers drawn between 1 and 12 from the 9:45pm GMT draw. Otherwise you can bet on Millionaire from the UK with the exact SAME (if not higher) jackpots, the exact SAME odds of winning, the exact SAME number picking format, on the exact same days (Tuesdays and Fridays) as the biggest lottery in Europe. But Millionaire bets cost just £2 and with a huge number of additional fantastic features, such as DoubleJackpot, NumberShield, Last Minute Bets, Magic Million and many more! And don’t forget: with Millionaire, you’ll get loads of regular of bonuses and promotions that are completely exclusive to Lottoland. 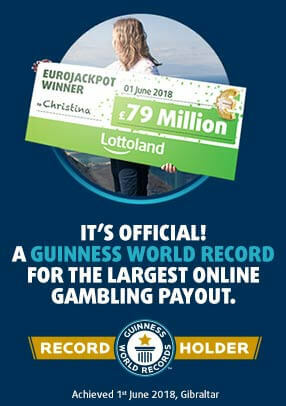 If you are familiar with Europe's biggest lottery then you will know how Lottoland's Millionaire lottery product works. Simply go to the Millionaire page at Lottoland to be in with a chance to bet and win. As with the biggest European lotto you choose 5 numbers between 1 and 50 and two extra numbers between 1 and 12 and the cost of a line bet is just £2. You can also win lower tier prizes for matching at least 2 numbers correctly. Then just sit back, wait for the results and hope that your numbers come up! Try out our lotto betting game Millionaire that gives you all the things you love about Europe’s biggest lottery for only £2.